I have a friend, a fellow LGBT person, whose very favorite holiday when we were growing up was the 4th of July. I never could quite wrap my mind around that preference—to me Christmas was better by a longshot. I also have to admit I didn’t yet understand how, especially as an LGBT person, one could claim pride to be from a country in which individuals and communities can explore, become, debate and critique freely. To me the 4th of July was bound up with patriotism, and to me the latter evoked Americana, ‘family-values’, apple pie, anti-immigration, anti-change, etc. Not my cup of tea (though I do make a mean apple pie). But one February about five years ago my partner and I were walking in Concord, Massachusetts near the Old North Bridge. We were in the throes of figuring out what would happen to our relationship as I prepared to transition. I was already using my current name and had some medical procedures on the calendar that had taken a lot of discernment, preparation and coordination. Everyday events—being greeted at checkout counters and receiving mail, for instance-- brought up a strong sense of dissonance between myself as I and those closest to me knew me and the expectations others projected onto me. I was struggling to carve out a place for myself and resisting enormous social pressures to do so. We were in Concord that day because I love the old burial grounds we have here in New England, the ones with the rounded tombstones with medieval-looking skulls and crossbones. 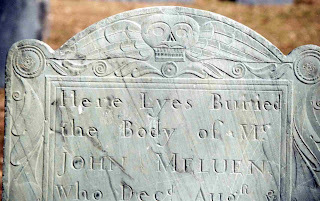 There’s something about that raw, yet exuberant, Puritan aesthetic that I’ve come to love, paired up with inscriptions that emphasize embodiment—we’re not talking mere memory, we’re talking ‘here lies buried the body’. Here, on the 19 of April, 1775 was made the first forcible resistance to British aggression. On the opposite bank stood the American Militia. Here stood the Invading Army and on this spot the first of the Enemy fell in the War of that Revolution which gave Independence to these United States. 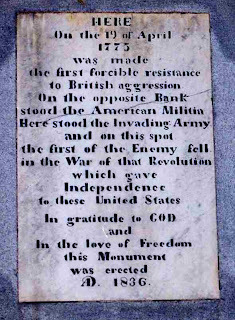 In gratitude to God and in the love of freedom this monument was erected A.D. 1836. I was so struck by these words that I took a photo and pasted it on the inside cover of my journal. This action was highly unusual for me. No patriotic words had ever struck a personal chord before. There was something about “resistance” against an Goliath-like aggression, the sense the phrase conveyed of feeling gradually, increasingly squelched and, when it became unbearable, needing to create a space in which to breathe, to live freely. And, movingly, there was an expression of gratitude to God for that freedom. Two months later on the day of my first shot of testosterone—‘T’, as it’s called in trans circles-- I was celebrating with some friends over beer in Cambridge. My partner was out of state doing a post-doctoral fellowship, and I would be joining her the following year. But that night, as I regaled my comrades with the day’s events, one of them noted the date: April 19th. The state holiday was to be on a Monday, but this was the actual ‘Patriot’s Day’. “Dude!” a friend joked, “yours was the T shot heard ‘round the world!” Who knew? When I got home I looked inside the front cover of my journal. The inscription included the date. On April 19th, 2002 I began a very different sort of journey of resistance. Transition wasn’t the only journey I was on then. I had started a doctorate that fall, and I was also a candidate for Holy Orders in the Episcopal Diocese of Massachusetts. Just about three years after ‘T-Day’ I was ordained to the (‘transitional!’) diaconate. The day after my ordination I took a friend, visiting from California, to the Old North Bridge. We paused in front of the obelisk. It had already been a long journey, and I also knew it was only the beginning. What stays with me, and particularly strikes me this week of the 4th of July five plus years after my transition, is the sense that a single act of resistance is never enough. After all, what began as resistance against British oppression also brutally wiped out native peoples across this land and now all too often participates in the oppression of others both within and outside our national boundaries. In the days since September 11th the value of that freedom itself—especially the freedom to critique-- has fallen under steady assault. As someone who now moves easily through those same everyday encounters that used to chafe, who gets offered white, heterosexual male privilege at the drop of a hat—though not in every context, and not as long as my history is known-- I have to keep choosing to resist lest my freedom unwittingly become the instrument of another’s oppression. At the same time what I feel more than anything else is gratitude. I am profoundly grateful to be in a country where I am free to be, and become, myself. In how many places around the globe would that be possible? Stir up your power, God of Mystery and Might, and grant us the strength to celebrate the freedom with which we are endowed in your image (BCP Catechism, p. 845), and to have the strength always to resist oppression, wherever it may surface. Amen.